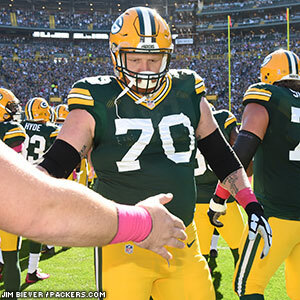 GREEN BAY — Packers starting right guard T.J. Lang was optimistic on Wednesday that the injured knee that forced him to leave last week’s game would not keep him out any longer, and he confirmed those thoughts on Friday. Since becoming a full-time starter in 2011, Lang has missed only one of a possible 75 games, including playoffs. He played through a damaged elbow in 2012 and a bum ankle the second half of last season. The only start he has missed in the last four-plus seasons was in Week 14 of 2012. So far this year, the only member of the offensive line to miss a start was RT Bryan Bulaga, who sat out three games with a knee injury and came back last week earlier than projected. That’s simply a mentality the entire unit has, as everyone is usually dealing with an injury of some kind at some point in the season. Lang is officially listed as probable on the Packers’ injury report. WR Davante Adams (ankle) and S Morgan Burnett (calf) are questionable, while DT B.J. Raji (groin) and LB Nick Perry (shoulder) are doubtful.